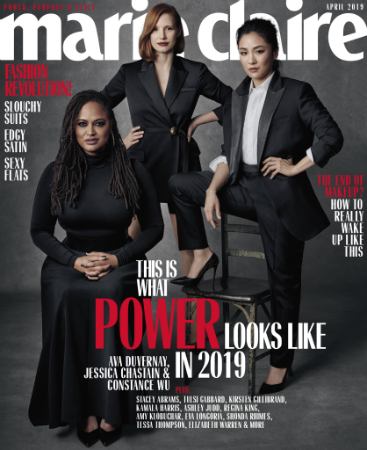 –Jessica Chastain, Constance Wu and Ava Duvernay cover Marie Claire, where they talk about the importance of inclusion and representation, and learning how to not obsess about accommodating others. -Sad news for for those of you who even knew they were dating: Rita Ora and Andrew Garfield split up. -I’ve watched this clip of Jennifer Hudson and Tom Jones spontaneously singing at each other more times than can be considered normal. –Keri Russell and Adam Driver (who are costarring on Broadway) are so damn funny and charming in this NYT profile. -You can tell Brie Larson and Samuel L Jackson have done a few movies together by this point; their chemistry is really easy going and nice. The Captain Marvel pair sang Ariana Grande and took a lie detector test on Carpool Karaoke. -Also, Larson and Jackson sang “Shallow” on The Jonathan Ross Show and they were pretty damn great. –Heidi Montag defended The Hills reboot’s lack of diversity by pointing out her co-stars’ hair colours. So that happened. -Also, I keep forgetting that Mischa Barton is in this thing. –Gwyneth Paltrow says that her persona shift from a whiskey-drinking, cigarette-smoking cool girl to a health nut had everyone “thinking I was a crackpot.” Who is this whiskey-drinking badass she’s speaking of? -HBO’s The Case Against Adnan Syed will follow Amy Syed’s process of seeking and winning an appeal post-Serial. -I liked this piece a lot about how Steven Spielberg isn’t right about Netflix — but he’s not entirely wrong either. I’ve been surprised by they lack of debate and the full-throated support of Netflix (who does some not great stuff). At the very least, they *should* disclose their box office numbers if they want to be Oscar contenders. -Oh my goodness, the Good Omens trailer is all kinds of fun. 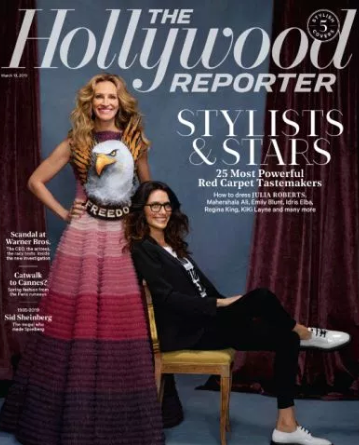 -I very much enjoyed this look back at Julia Roberts’ “Fellini summer”, a dramatic few months which included leaving fiance Kiefer Sutherland for Jason Patric, fighting with Steven Spielberg on Hook, being hospitalized for the “flu”, and walking away from Shakespeare in Love. -You know, I’ve been pretty checked out on Arrow for a while and mostly just catch up with it out of routine these days, but compiling all these cast and fan social media posts about the show’s ending for this story hit me harder than I thought it would, especially Stephen Amell‘s tearful Facebook video. There were seasons when I LOVED this show, and I’m glad it’s getting to go out on its own terms. -Meanwhile, I’m thinking this TV blind item from a while ago was probably about Amell. -The trailer for Mindy Kaling’s Late Night starring Emma Thompson is everything I’ve ever wanted.